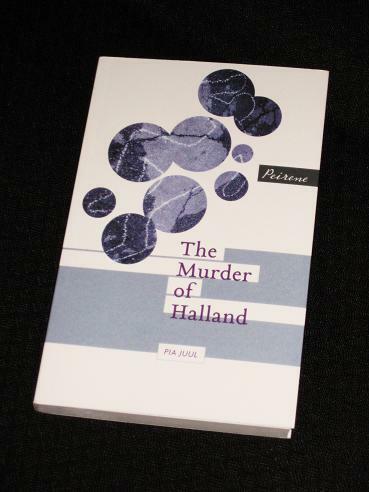 Pia Juul’s The Murder of Halland (translated by Martin Aitken) is a dark, deliberately confusing, literary crime novel, a welcome twist on the wave of Scandinavian detective fiction which has recently been invading our shores. The novel is told through the eyes of Bess, a forty-something divorcée who left her husband a decade ago for the enigmatic Halland, a wealthy, hard-working older man. Given the title of the novel, it is hardly surprising that his appearance in the book is a rather brief one – within a matter of pages, poor Halland is found gunned down in the street outside his house. The first Bess (and the reader) learns about the murder is when a local man knocks on her door and blurts out that he is arresting her for the murder of her husband. The fact that the man is not a policeman – and that Bess is not actually married to the recently departed Halland – takes something away from this rather dramatic announcement… Once the initial shock has died down however, Bess is left to answer a few difficult questions. If she didn’t kill her partner, then who did? Where are his phone and laptop? And, perhaps most importantly, how does she actually feel about his death? And that, of course, is part of the charm of the book. The writer is playing with both the reader and the crime genre itself, casually throwing a murder into the first few pages of the story, then carrying on as if the identify of the murderer is of negligible interest. By concentrating on Bess, and not anyone involved in the investigation, The Murder of Halland takes us into an awkward realm where we’re not quite sure what we’re reading for – is it to solve the crime, or to find out more about our traumatised heroine? There is definitely a lot to find out about too. You would expect to feel a lot of sympathy with someone going through what poor Bess is experiencing, but she (or Juul) makes it very hard to empathise with her. She is rude, aggressive, ignorant, possibly alcoholic, and she apparently abandoned her husband (and her young daughter) for a relationship based purely on lust. While she is obviously affected by grief, you do begin to wonder whether she’s really just a rather horrid person. The Murder of Halland is a wonderful little book, a play on a detective novel with a plethora of clues, red herrings and characters suspicious by their very presence scattered throughout its pages. In many ways, not least of which is the presence of a slightly unreliable narrator, it reminds me of another Peirene offering, Matthias Politycki’s Next World Novella. Like Politycki’s book, it’s a story which forces the reader to pay attention to detail (including the delightful Inspector Morse-esque quotations which precede each chapter), and it’s a book which will definitely stand up to rereading. But, I hear you ask, do we find out who the murderer actually was? hope to be reading this soon, as the synopsis has appeal, at the moment reading Sjon. Great review. I also reviewed it for the Crime Fiction Lover website and said there that for those expecting standard Scandinavian crime fare, it would not be suitable. However, as an elegy on grief and the inability to ever fully comprehend the human heart, it is a beautiful piece of work. Marina – Thanks 🙂 I'm not really a fan of crime fiction; this is much more my cup of tea. I thought Bess did grieve – but for Abby, and in a way that didn't leave much room for Halland. She seems shocked by his death, and bruised by the experience, but there was (for me) also a sense of relief. His death releases Bess from a clearly unsatisfactory relationship that seems to have been based on guilt, lust, and duty. You do get the sense that she's gained more than she lost. I just finished reading this and I'm feeling completely underwhelmed. The choppy sentence structure might have mirrored Bess's distracted thoughts, but it drove me nuts. It's a clever book in that it subverts the genre and subverts our expectations, and raises more questions than it answers, but it felt slight and empty to me. I expected something a bit more profound, but then again I don't read crime novels so I'm probably expecting too much. P.S. Other readers have commented on how the book explores grief and the effect it has on Bess, especially as she probably feels more relieved than she thinks she should about Halland's death.